The late great Umberto Lenzi gave audiences some of the most notorious video nasties including his legendary gut-crunchers THE MAN FROM DEEP RIVER (1972) and CANNIBAL FEROX (1981). However, the maestro of macabre, nightmare-making images was rightly most proud of his giallo classics - most famously represented by the colourful intrigue of SPASMO (1974) and the gruelling gore of EYEBALL (1975). 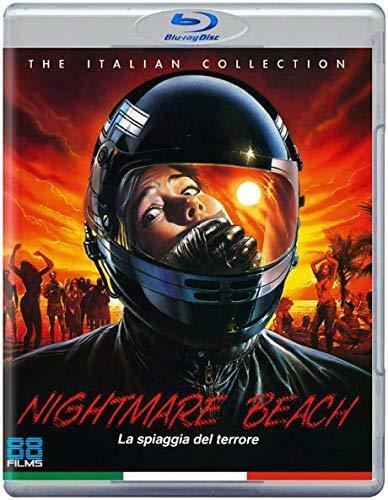 For NIGHTMARE BEACH, released in 1988, Lenzi would claim that a troubled production process meant he took a 'backseat' role - although it is difficult not to notice his blood-splashed paw-print all over this terrifying tale of a madman in a motorcycle helmet who is taking out drunk and delicious young co-eds all over the sparkling sands of South Florida. As the body count creeps up, Miami detective John Saxon (A NIGHTMARE ON ELM STREET) tries to keep ahead of the curve in this carnage-packed, late-day Lenzi gem that is only now gaining a belated British bow for horror-hungry addicts and completists of Italian trash-terror!